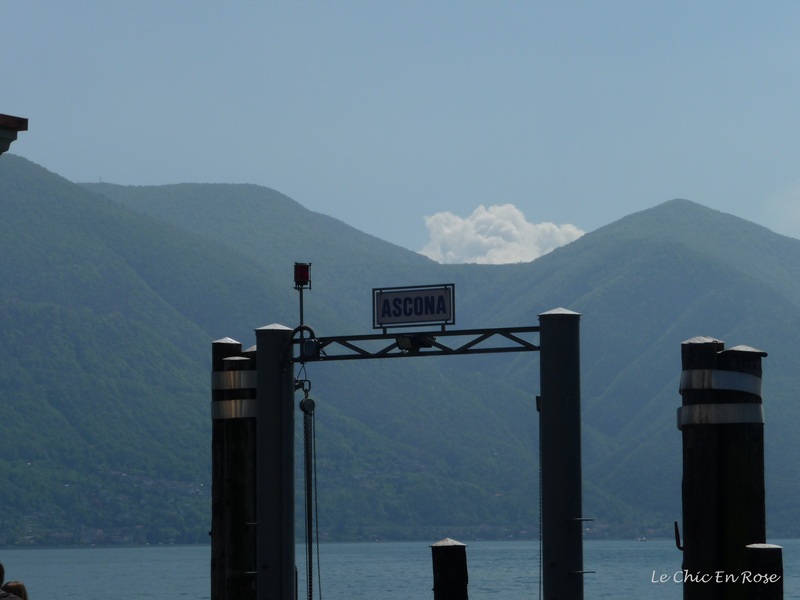 After our wonderful visit and walk round Isole di Brissago, we hopped on the ferry for the short trip back to Ascona on the mainland. This charming town lies adjacent to Locarno and is easily reached by car or bus in a matter of minutes but if you have more time the ferry ride along Lake Maggiore is the more scenic and leisurely option. Ascona has the romantic feel of an old fishing village combined with the glamour and chicness of a lakeside Swiss/Italian resort. The promenade along the lake is dotted with pretty cafes, restaurants and hotels taking full advantage of the superb setting. We were very hungry by the time we arrived and keen for a late lunch! To be honest I don’t think we could have made a bad selection as all the menus we inspected looked wonderful but we were drawn to the vibrant colours of the Albergo Al Porto Ristorante and so alighted on their front terrace, sat back and basked in the warm spring sunshine. It was quite idyllic – the food was delicious, the view of the shimmering lake mesmerising and the atmosphere laid back and casual. The restaurant is attached to the Al Porto hotel and I’m pleased to say it is still very much in business and you can find out further details here. The website for the most part is in German, which is interesting given that Ascona is in Italian speaking Ticino. I should therefore imagine that it is used frequently by Swiss German visitors coming down in search of southern sunshine. You don’t need to speak German or Italian to admire the photos though! We eventually prised ourselves off our chairs and set off to explore the little streets that led off the promenade. 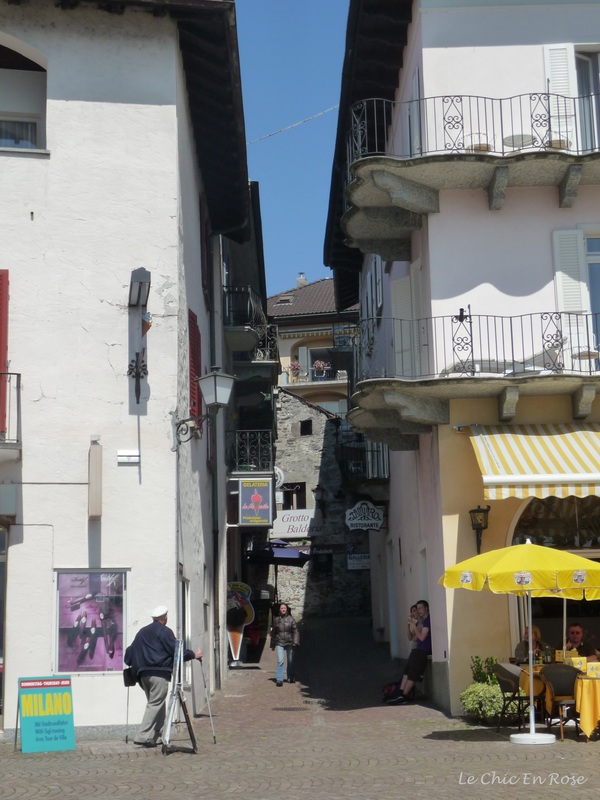 The Old Town of Ascona has buildings dating back to medieval times, cobbled streets that all ultimately lead back to the lake and many pretty shops and boutiques. We didn’t have much time so I couldn’t explore the shops (Monsieur Le Chic did not seem too perturbed by this!). We did come across two fine looking churches, Santi Pietro e Paolo, (which has a magnificent interior though we hadn’t time to go inside) and the impressively named Church of Santa Maria della Misericordia (part of the Catholic school, Collegio Papio). We wended our way back to the lakeside promenade and enjoyed a last walk along the front to the end and back before reluctantly setting off back to our Locarno base via the ferry. Le Chic En Rose is setting off on travels in the near future – more details next week! In the meantime I’ll leave you with a lingering look at Ascona from Lake Maggiore. Caio for now! Good to know I’ll never run out of lovely places to visit. I hadn’t heard of Ascona before but it’s definitely charming. I can’t wait to read where you’re headed to next. Thanks so much – Ascona is a beautiful little town tucked away at the northern shore of Lake Maggiore the Swiss end 🙂 Heading off to Europe again visiting family then a sideways trip to Europe – in the rushing around organising phase at the moment! Love the oranges of Ristorante Albergo against the blues of Lake Maggiore, the clock tower at the Church of Santi Pietro e Paulo Ascona, the view of Ascona from Lake Maggiore and of course, every picture with a boat in it. What a lovely place! I misread the title as launching in Ascona and thought that it was going to be a boating story! Wow Rosemary – those views and those ice-creams!!! Both are splendid. Looks like a gorgeous little place to explore, all your pictures are stunning but the last one with those snowy peaks in the background is really spectacular. Enjoy your weekend! Wow, Ascona looks absolutely beautiful. I love the old, cobbled streets and cafe/restaurants by the water – it must have been very peaceful. Those ice creams look delicious! This is my type of relaxing! Beautiful place, I am jealous…. It is lovely somewhere I’d love to go back to some day! Thanks Allane and I’m so glad the badge worked first time – thanks for the instructions they were easy to follow! I’m glad you liked the post – it’s such a beautiful place isn’t it? We stayed round the corner in Locarno and really enjoyed the Swiss end of Maggiore. 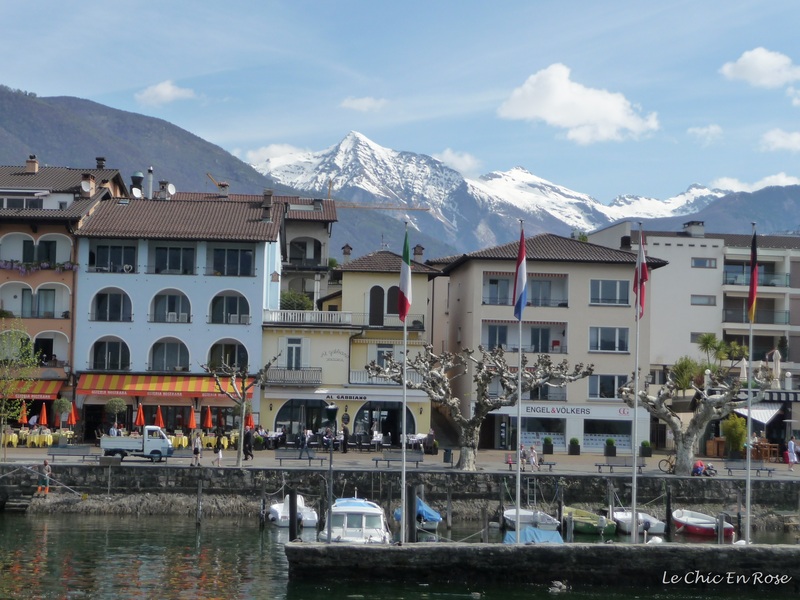 In fact the Ticino canton would be well worth exploring further – obviously places like Ascona do attract a lot of tourists especially in the summer months but there are lots of little towns and villages that sound well worth visiting. It’s an interesting place very Italian in many respects and yet still part of Switzerland. 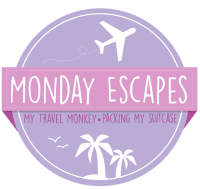 Am happy to be part of the #Monday Escapes too it’s a great idea! 🙂 I don’t have a twitter account or instagram just a facebook page for Le Chic En Rose at this stage! I am sure you will be back there sometime… maybe on your next trip to Europe! !